The secrets to good pastry: 1) make sure your butter and water are ice cold, and 2) don’t overwork the pastry – stop mixing as soon as it comes together. As simple as that! Whenever I need to make a batch, I double the recipe and freeze one quantity. Its really no extra work at all, and means next time I want to whip up a tart I can skip straight to the filling! The pastry can be frozen for 3 months. Simply defrost the pastry overnight in the fridge. Mix the egg yolk and iced water together lightly. Process flour, butter, salt and sugar together in a food processor until the mixture looks like fine crumbs*. 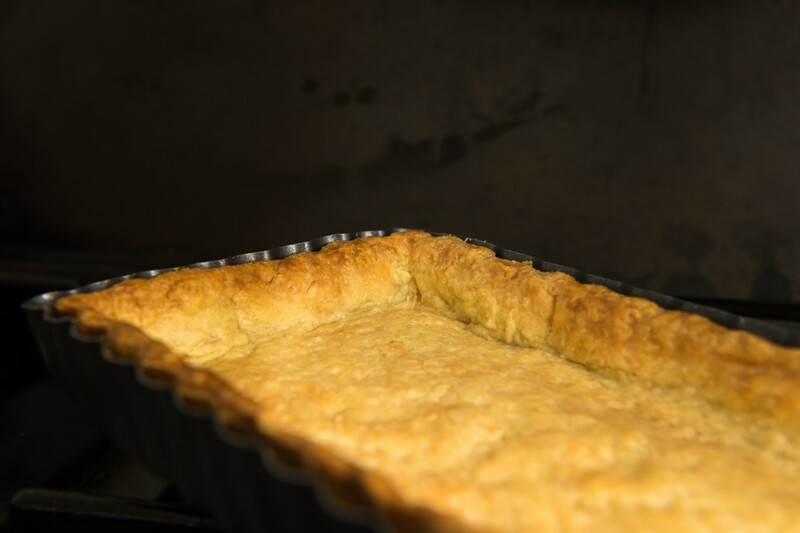 Add the egg yolk and water mixture and process just until pastry forms a ball – do not overmix. Cover with cling wrap and refrigerate for 1 hour. Roll out to approx 4mm thick and use to fill tart tin. Use as per recipe or if baking blind (without filling), prick with a fork then bake with baking paper and baking beans at 200°C for 12-15 minutes, then remove paper and beans and bake for a further 5 minutes. *If you don’t have a food processor, use your fingers to rub the butter into the dry ingredients until it resembles fine breadcrumbs. Then slowly add in the beaten egg/water mixture and mix until it comes together.